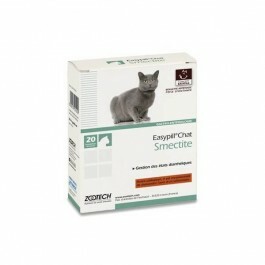 EASYPILL SMECTITE formula for cats is a supplement for the support of cats with acute intestinal absorption disorders. EASYPILL SMECTITE pellets contain a superfine bentonite green clay with amazing toxin absorption properties to support cats with acute intestinal problems. 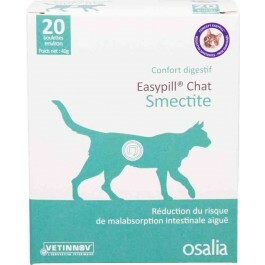 EASYPILL Smectite helps to reduce the intensity of diarrhoea, absorb toxins, reduce dehydration and physiologically protect the gastrointestinal mucosa (gut lining). 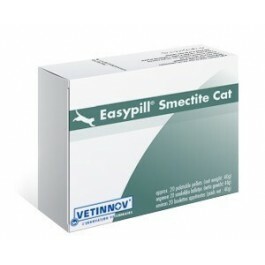 For example, if you have any medication provided by your vet, you may conceal it in tasty EasyPill Smectite Pellets and offer it to your pet as a tasty treat. Give 2 pellets twice per day (preferably before a meal) for 5 days. 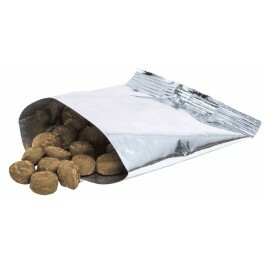 Cats will usually spontaneously accept the pellets due to their excellent palatability. Contact your veterinary surgeon if symptoms do not resolve in 2-3 days or if behaviour changes, for example if there is a loss of appetite, fatigue, or depression. EASYPILL HAIRBALL formula for cats facilitates intestinal elimination of hairballs. EASYPILL LIVER formula for cats supports liver function in cats suffering from liver problems. EASYPILL KIDNEY formula for cats supports kidney function in cats suffering from renal insufficiency. EASYPILL CAT RESOLVIN Convalescence is a dietary supplement designed for the nutritional support of cats during convalescence. EASYPILL SMECTITE formula for dogs is a supplement for the support of dogs with acute intestinal absorption disorders. EASYPILL LIVER for dogs is a nutritional supplement to protect and support hepatic function in dogs in the case of liver disease. EASYPILL KIDNEY for dogs is a nutritional supplement to protect and support renal function in dogs in the case of chronic renal insufficiency. EASYPILL RESOLVIN FLEX for dogs is a nutritional supplement to protect and support joint function in dogs.